"The wait is over. STAR. TREK. IS. BACK! 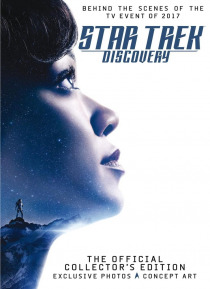 Star Trek is back on TV with the all-new incarnation, Star Trek: Discovery! If you want to find out everything about this thoroughly modern take on Star Trek then the Star Trek: Discovery Special is essential reading! Packed with profiles of the new Starfleet crew, and interviews with the cast; Behind-the-scenes features; and all illustrated with l… avish photography and production designs! Come on a voyage of discovery, with Star Trek: Discovery Collectors Edition! "